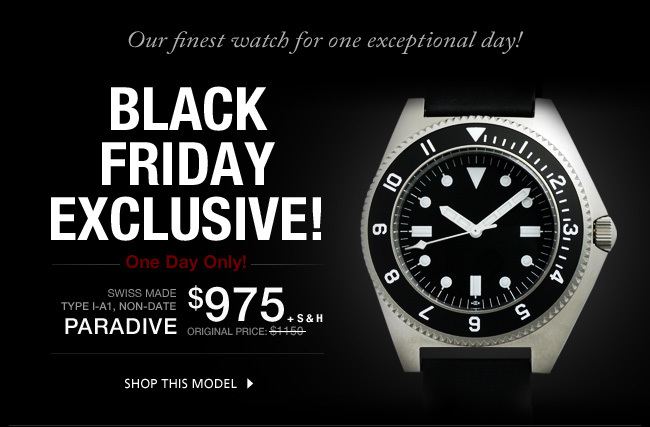 MKII will be having its one day Black Friday Exclusive this Friday. For one day only, collectors will be able to purchase the Paradive Type I-A1, non date at a 15 % discount. 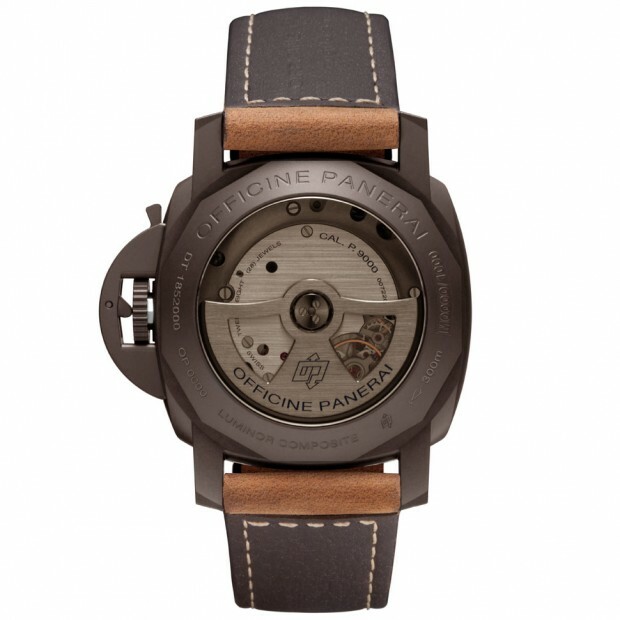 The Paradive is inspired by the watch issued to the US Special Forces and CIA maritime units from the 60s, 70s and 80s. These watches were not available commercially. 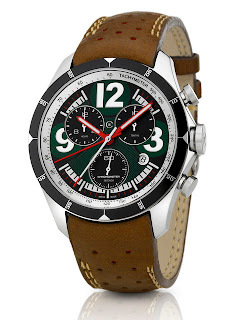 So this is an opportunity for you to get the modern interpretation of the issued watch. I just received this today. 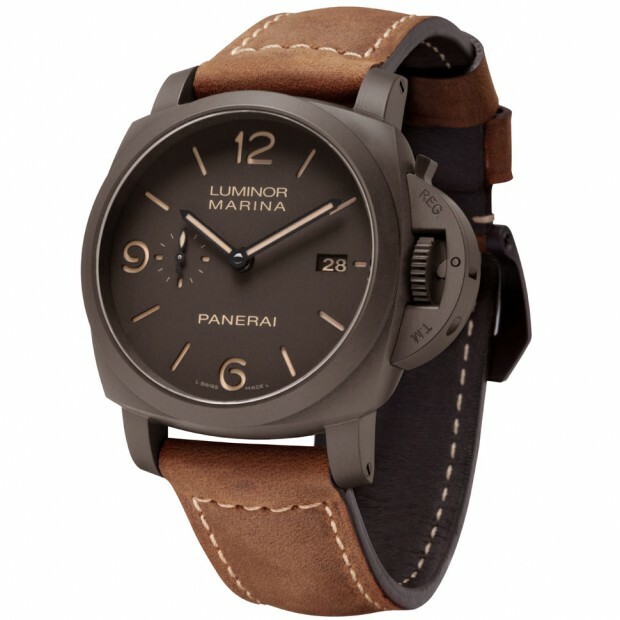 A very nice looking watch. 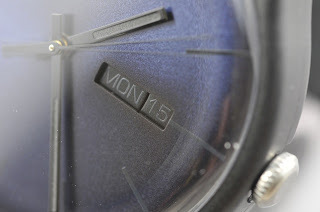 I will be posting a review on this watch soon. 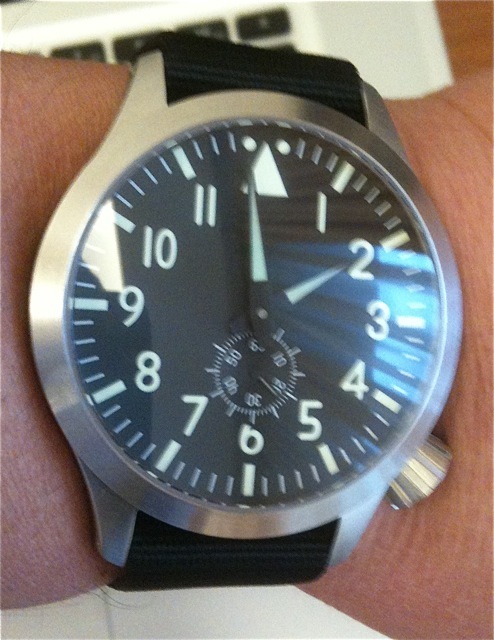 Thank you Riley of Watchshock in assisting me to get the watch. 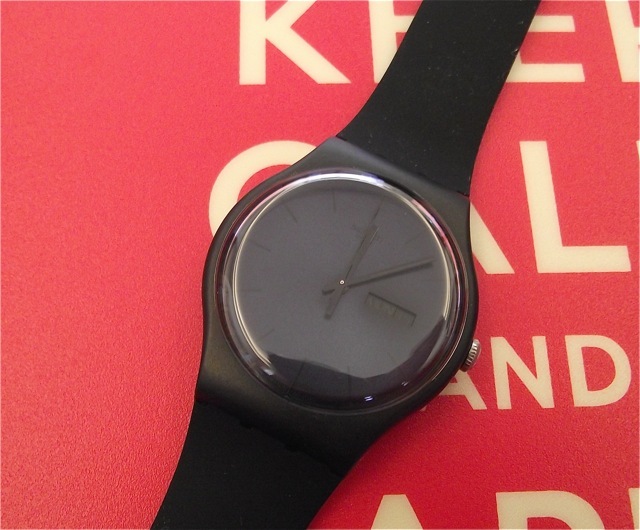 It comes with a mil series 22 mm black strap. The watch on my hand. 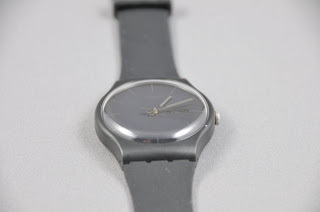 It is a 46 mm watch. Look at the 9 mm diamond crown. Thank you Sjors for the brilliant article and video. I finally got the Black Rebel watch from Swatch. It was not difficult as there are many Swatch dealers here in Taiwan. 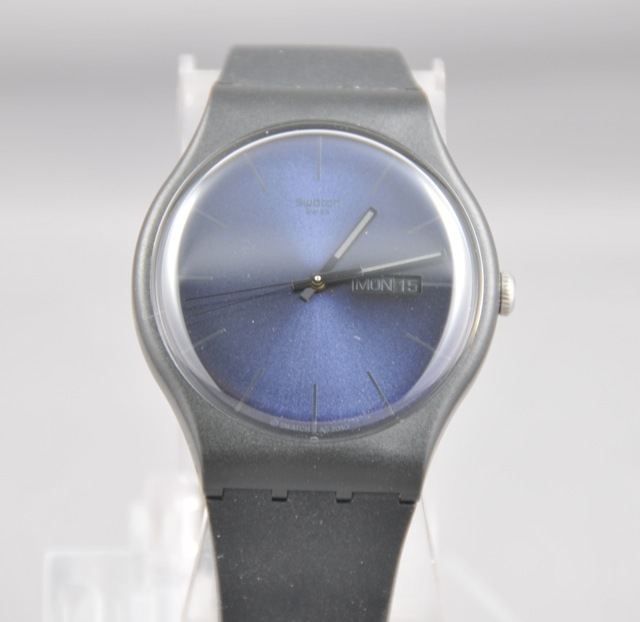 I was told that this model is one of the most popular watches from the True Colours Collection. 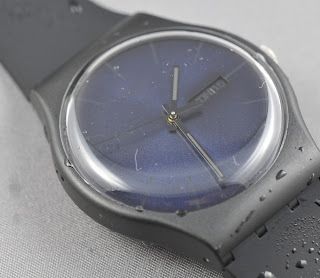 Here is a small review of the watch. 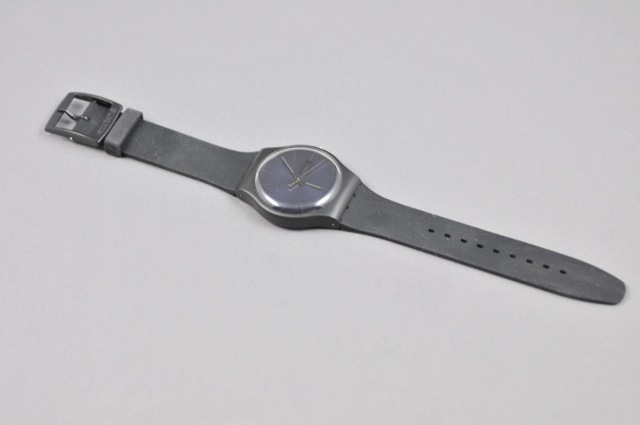 The watch is a one-piece design. 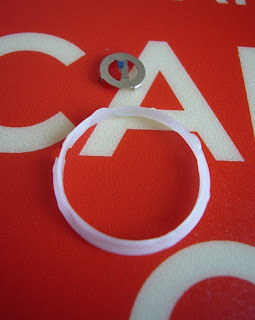 It is made of either polycarbonate or plastic. The case is well made and well finished. You can’t see the seams of the mold on the case. The case has a matte finish. 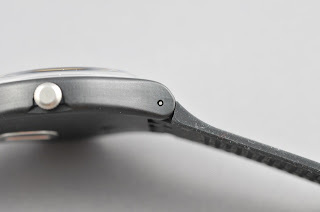 The case lugs have lughole to push out the strap pins. As with most Swatch watches, the lugs have two tabs. The case has two access points, the top and a battery access on the case back. The battery access hole is slightly raised at the edges. This does not affect the wear comfort of the watch. The markings that you can find on the case back: # 036 which I suspect is the case mold number (I stand corrected on this), ‘Patented Water-Resistant’ in the middle of the case back. Below this you find the ETA logo, indicating the movement powering the watch, the SWATCH logo, Swiss Made below that and V8. I don’t know what V8 signifies. You then find the battery information. This is great, as you know what battery to get if you want to replace the battery yourself. 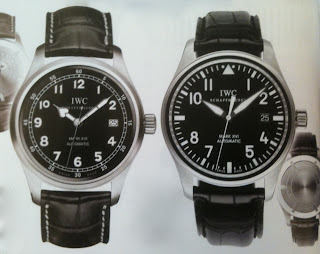 The watch is fitted with the 390 type or SR1130SW. 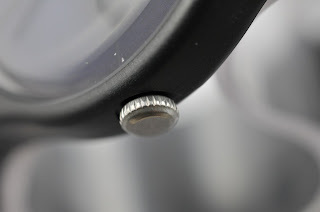 The crown is made from stainless steel and is the only part of the watch that is not black. It would be great if it were also black. 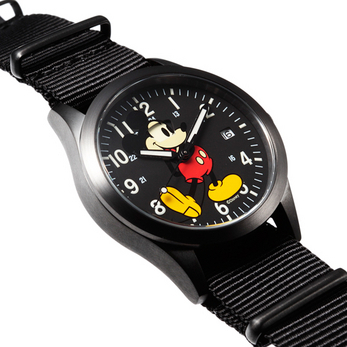 That would make the entire watch stealth like. 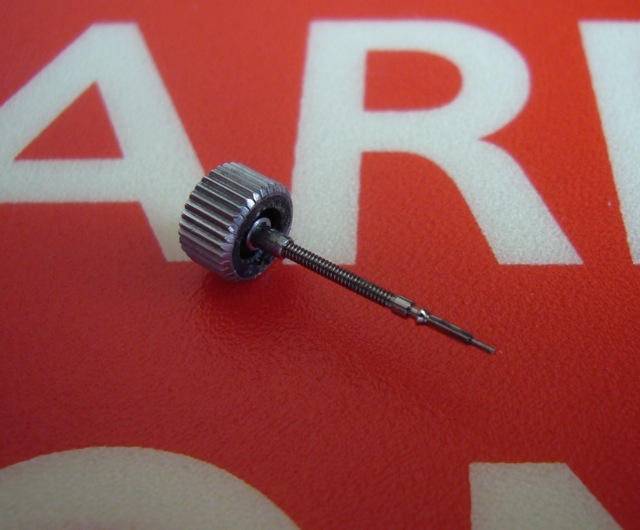 The crown is not of the screw-down design. It measures 4.5 mm in diameter and 2 mm thin. It is unsigned. 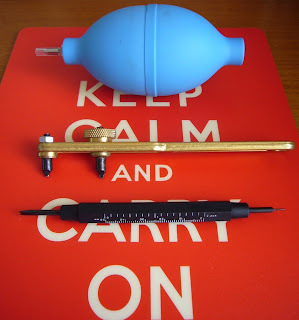 Although the size of the crown is small, it is easy to use. 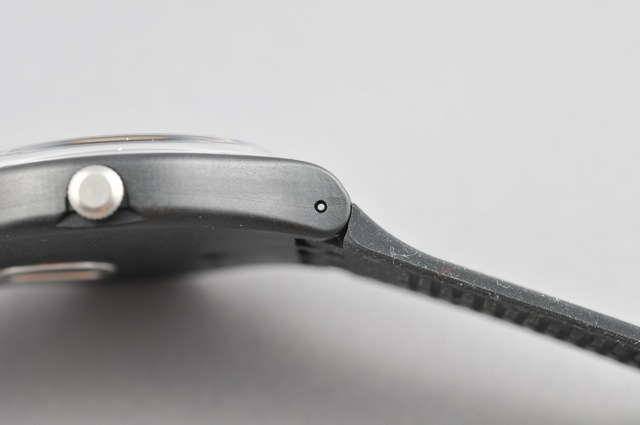 There is a notch on the case back that makes it a pleasure to use and operate. 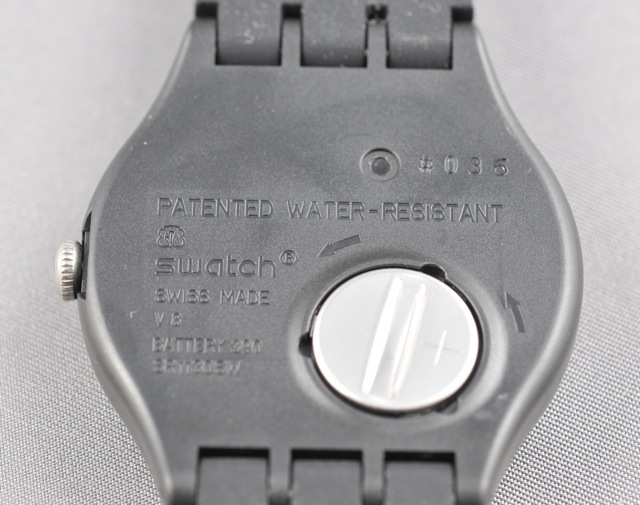 It pulls out to adjust the time, day and date. 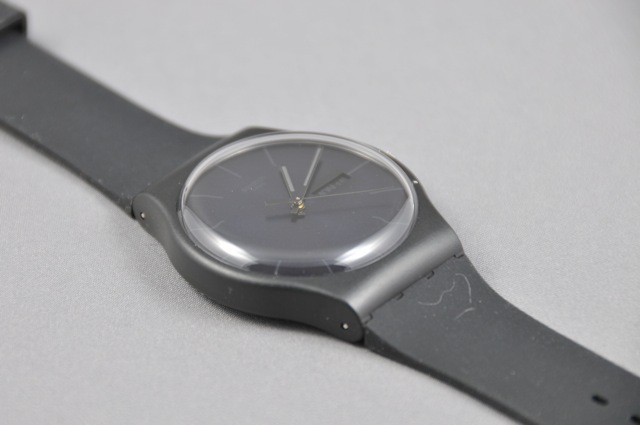 This watch comes fitted with an ETA quartz, 3 hands with day and date movement. I cannot verify what movement it is as it does not have a display back and I cannot open the watch to see. Well I could but that would ‘damage’ the watch. 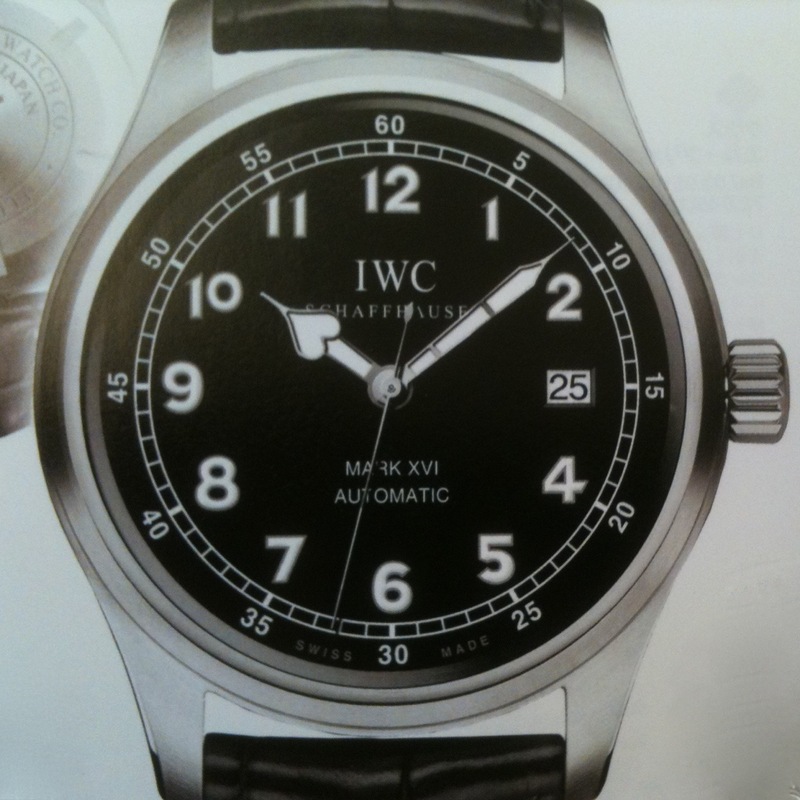 All I can say is that the accuracy for this watch should be good, as good as any quartz movement should be. The movement should be very reliable as it is made by ETA. 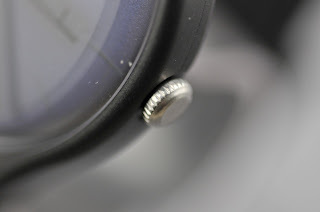 The movement 'hacks' as all quartz movement does. The movement has quick day and date setting capabilities. I have to say that I love the dial. The dial has a 'sun burst' design and it originates from the center of the dial. 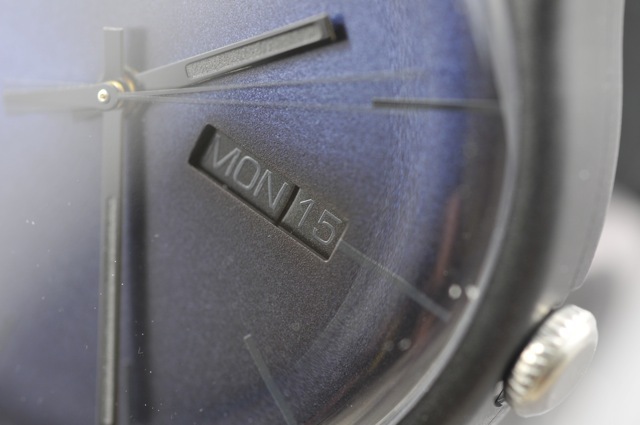 This sun burst design makes it easier to tell the time. Is has a reflective surface and contrast well against the matte black hands. 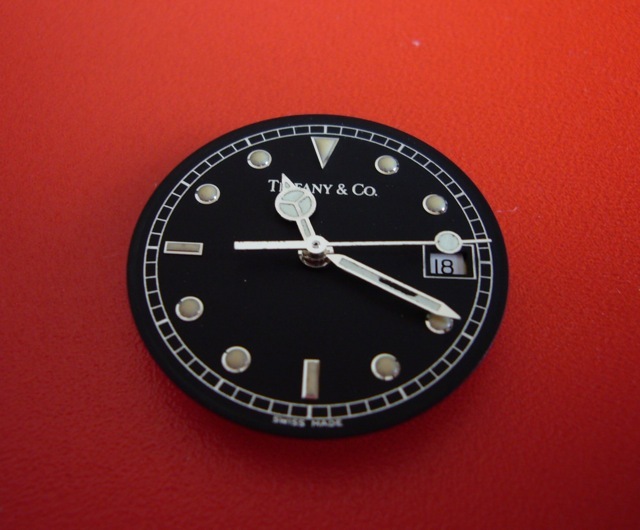 The dial is black in colour. It has a window at the 3 o’clock position, one for the day and the other the date. The day and date display is black on black. It can be difficult to read the day and date. 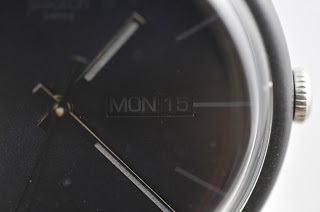 You need to look at the watch straight on to read the day and date. 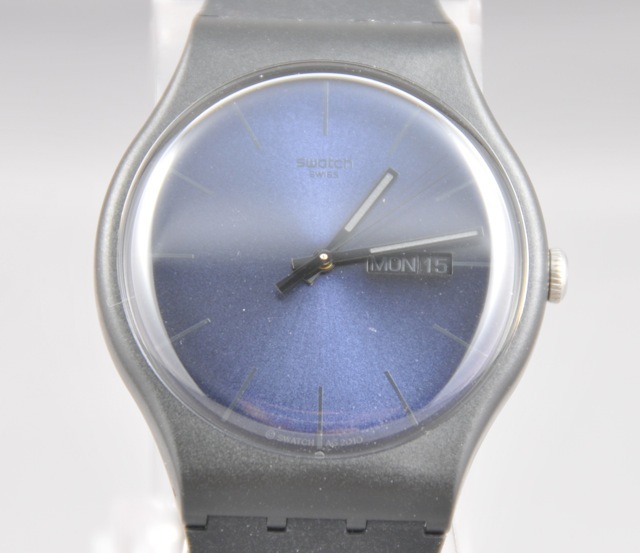 The hour index is of the baton type and it is matte black. 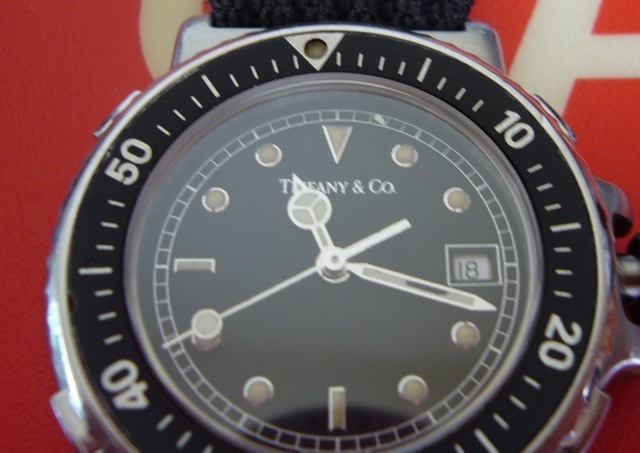 It is ‘easy’ to see as it contrast well against the sun burst black dial. There are no minute markings between the hour indexes. 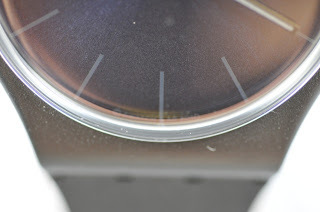 There are very little marking on the dial. 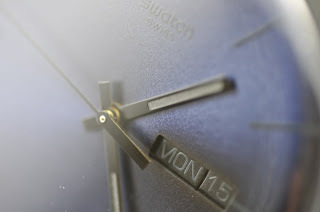 You find the Swatch signature at the 12 o’clock position and Swiss below that. The only other legend is below the 6 o’clock index, where you find Swatch and AG 2010. The hands are of the stick design. The hands are rendered in black but it has a polished finish. This makes it ‘stand out’ against the black sun burst dial. The hands are well made and well finished. The minute hand extends beyond the hour hand. This makes telling the time easy. The hands, except for the second hand, is luminous. 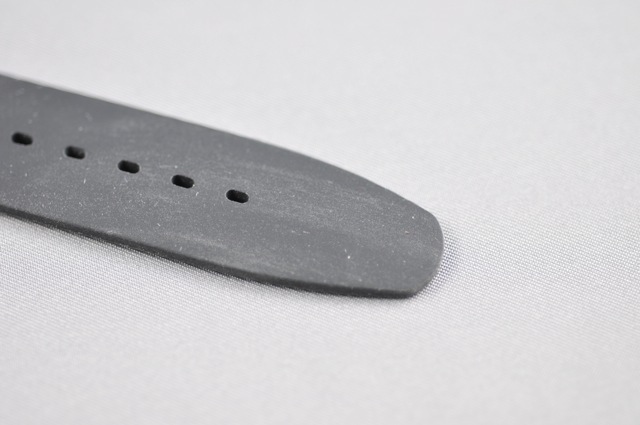 It is filled with black luminous material called Glow Glow black. It is not very bright and does not last very long. You can just make it out on the photograph below. 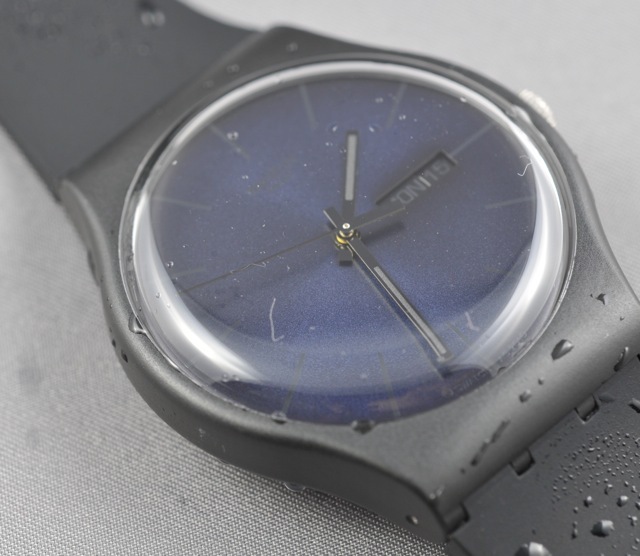 This watch is fitted with a acrylic crystal. The crystal is domed and it extends about 3 mm above the watchcase. This makes it prone to chipping and scratching. However you can polish the crystal. 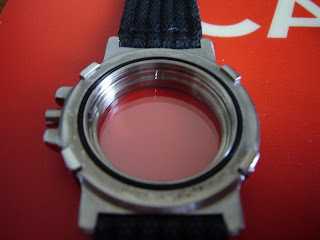 The crystal lacks any AR coating, which is great as it makes reading the watch under very bright light easier. 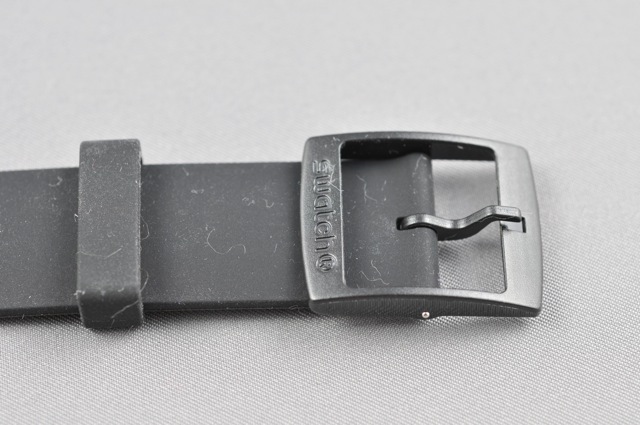 The strap I believe is made of silicon. It is very soft and very comfortable. However it does pick up dust and dirt very very easily. You can see this in the photographs. The strap is 20 mm at the lugs and flares out to 24 mm. This makes it flush against the case and provides an appealing look. It then tapers down to 19 mm. 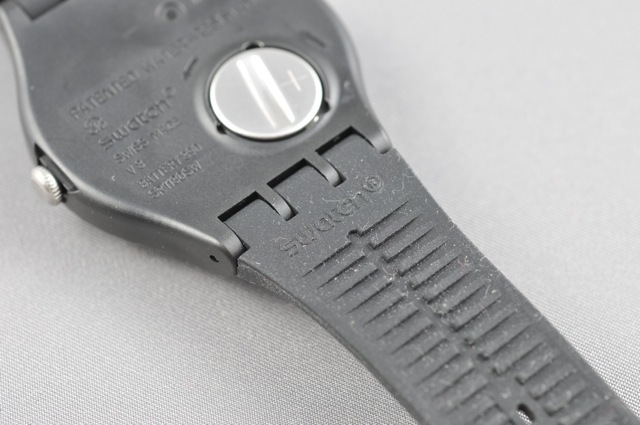 The strap measures 80 mm on the buckle side and 115 mm on the other side. 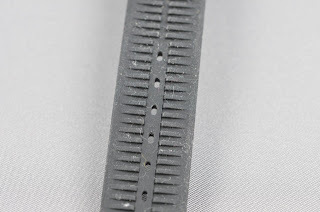 The strap is ribbed on the underside. 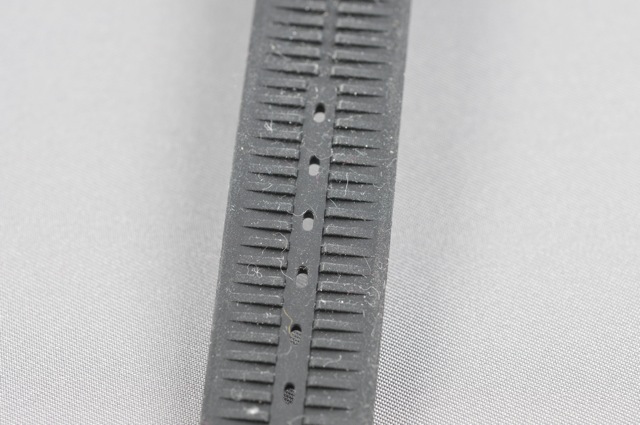 This makes it a comfortable wear as the ribbing provides cooling between the strap and your skin. 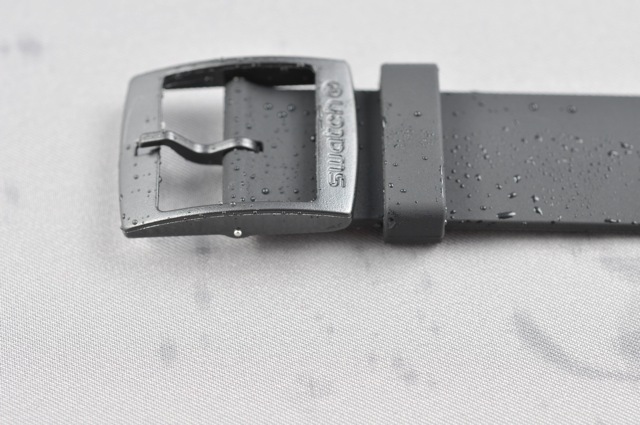 The strap comes with a single floating strap keeper. The strap is signed on one side with Swatch near the lug attachment point and ‘25/0’ on the buckle side near the buckle. As with all Swatch watches, the design of the strap (and lugs) makes it difficult to use independent straps. The buckle is made of the same material as the case. It has a matte finish and is well made. It is of the double loop design. It signed Swatch on the top of the buckle and has the numbers 10, 05, 4 and 15 at the corners. I have no idea what the number signifies. 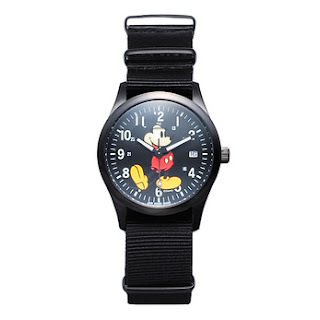 This watch offers great value for money. 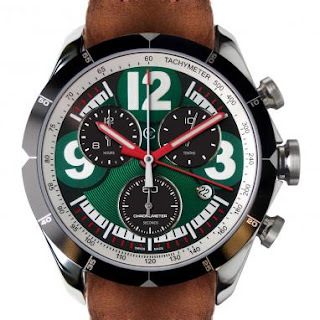 It comes with a movement from a reliable manufacture. The design is fresh. It is light and not very thick. 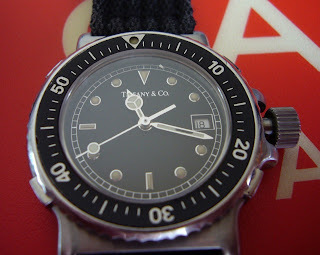 It does stand out as it is very stealthy and that is the very reason for buying the watch. Telling the time is not as difficult as I thought it would be. It is easy to use and operate. 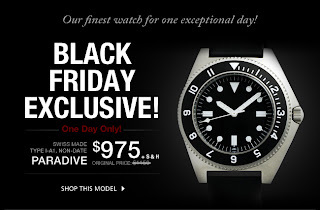 It has day and date function, something you don’t find in watches at this price range. It is comfortable. What more can you ask for. 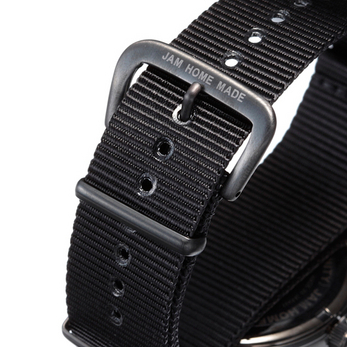 Jam Home Made has released its second watch. 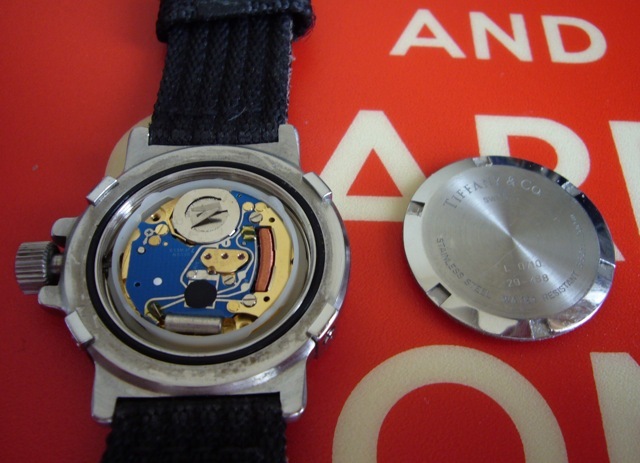 Again it features Mickey Mouse on the dial. The Secret Mickey Watch Type 2 is based on the popular classic military design. The watch is all black (PVD I believe). 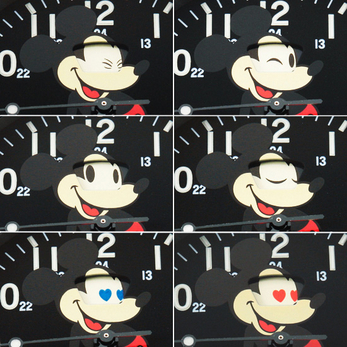 The unique aspect of the watch is the eyes of Mickey which changes on a weekly cycle. 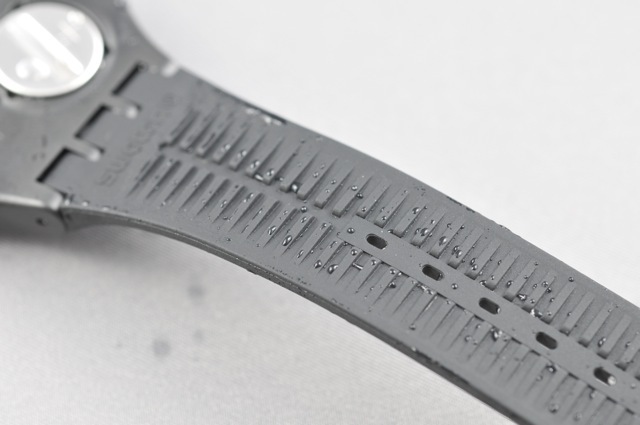 The watch is powered by a Citizen sourced mechanical movement. 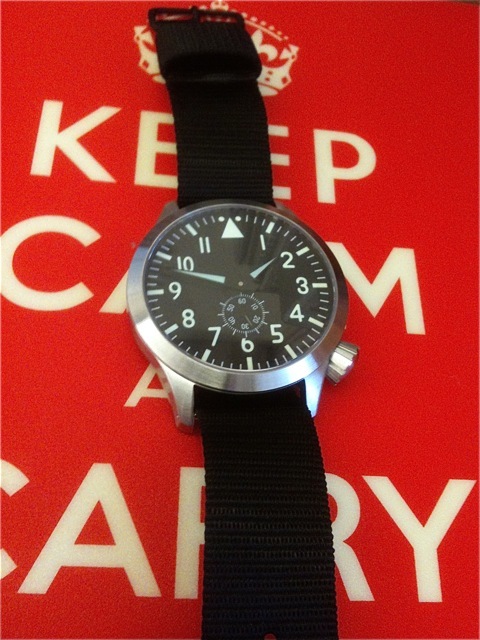 It is water resistant to 10 ATM and is issued with the military NATO type strap. It has the following functions; hours, minutes, seconds and date. 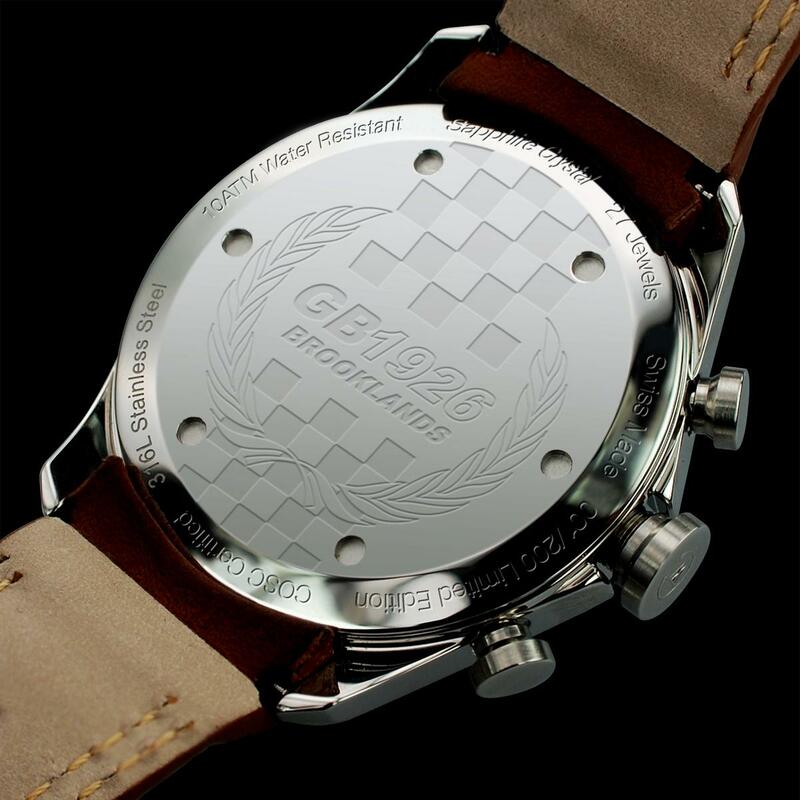 The watch, reference JAM 07030 is available via rumors stores in Japan. It is expected to retail for about USD 350. The NATO type strap. It is signed. 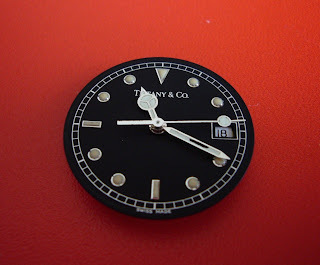 The watch dial. You can see the different expression Mickey display on a weekly basis. 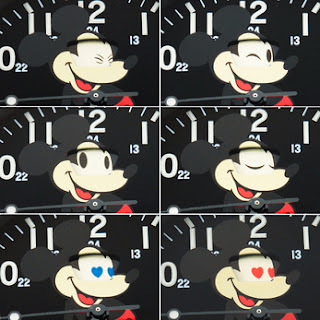 My friend asked if I could help him out with the watch. 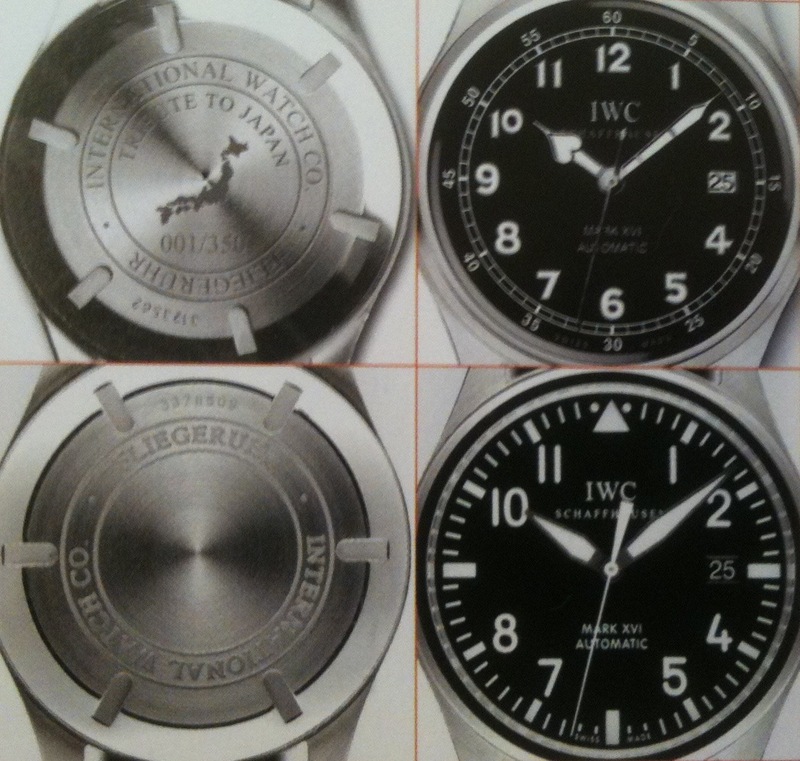 If you read the review, you would know that there were some luminous material missing from the minute hand. Evidently more material has fallen off and is now floating in the watch. He asked if I could remove it. I told him I will try. The watch. If you look closely you can see the luminous material on the crystal between the 12 and 1 o'clock hour marker. A closer view. It is best to remove the material. This is to prevent it making its way to the mechanism where it can cause damage. The tools. I forgot to show the tweezers. Remove the case back. If you notice, the crown is pulled out. I do this to stop the second hand from moving. 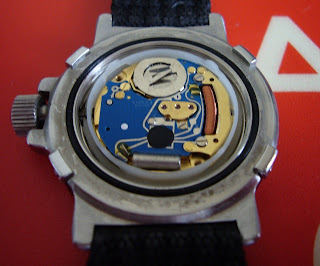 Next step is to remove the battery (not in the photograph), battery holder and the movement holder. Please do not touch the battery and battery holder with your fingers. The movement ready to be removed. 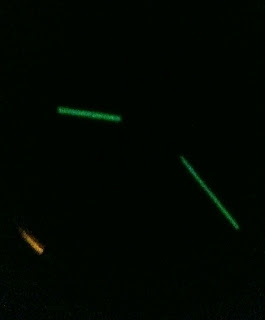 If you look closely, you can see an 'arrow' at the 10 o'clock position. This arrow shows the 'button' that you need to push to disengage the winding stem from the movement. Remember not to push to hard. The winding crown. 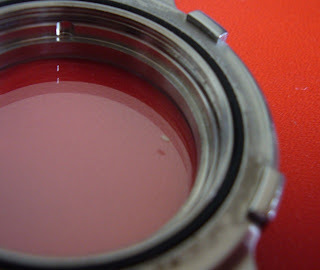 Don't forget to lubricate the gasket on the winding stem (if there is one). 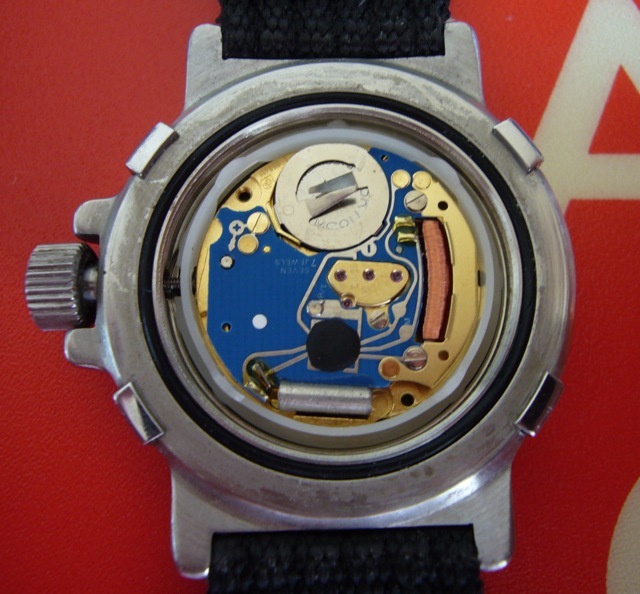 The movement and dial out of the watch. Use the blower to blow off any dust that maybe be there on the dial. 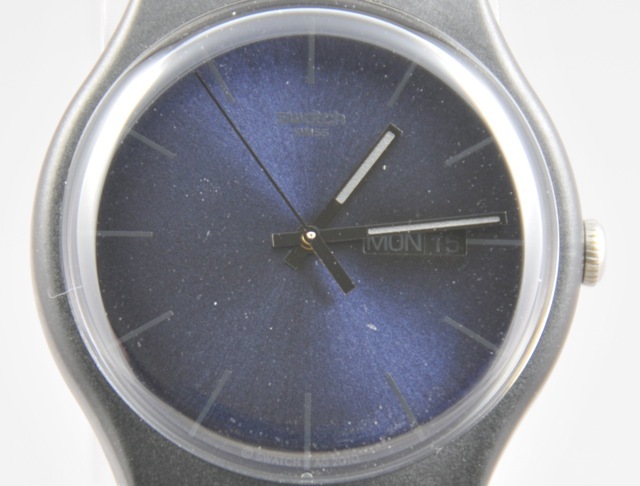 You can see where the luminous material is missing on the minute hand. I told my friend to send the watch to my friendly watch repair guy so that he can reapply the luminous material. I don't have the expertise to do the reapplication. The broken off luminous material. Use the blower to blow it out. Check to ensure that it is really gone and not stuck somewhere else. 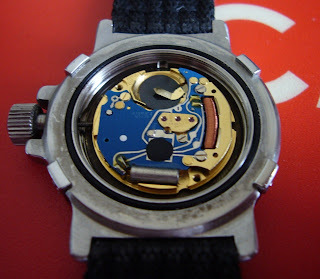 The watch ready to be put together again. Again, don't forget to lubricate the gasket. The watch all done. Sadly I forgot to take a picture of the dial side. Looks like it will an exciting SIHH 2011 for Panerai what with this watch and the new P.3000 movement. Time to start saving.